Christie and Evan Miga needed time off after the mad rush to bring Dog Powered Robot to Fringe last year. They had four months of extensive rehearsals and a whole cast of cardboard robots that were built. They were constantly managing people. After the show they decided to live in Paris for two months. Fisher Miga, the dog behind Dog Powered Robot went with them. Christie said that within four days they had settled into the Parisian lifestyle. Three days a week Evan freelanced for the design firm he was working for in Orlando. Though he was living in Paris, he worked Orlando hours, sharing his work via the Internet. That left the rest of the week open for the couple to explore Paris. They discovered quirky arts outlets that few tourists visit. Christie loved a tiny Museum of Magic that had rooms filled with mechanized tin toys. Right next to the Eiffel tower was a sumptuous garden that only Parisians frequent. 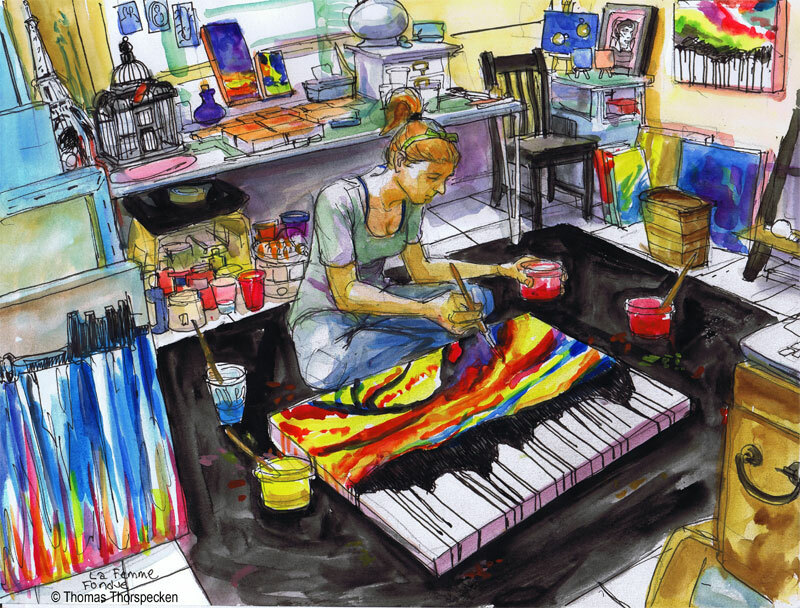 When Christie Miga returned to Orlando she started a series of paintings inspired by the trip to Paris. Though abstract, the work is autobiographical as she explains with pure color how Paris inspired her. This series explodes with rich vibrant color. The blue is the exact color of the Mediterranean and the bright magenta reminds her of tight bright magenta pants that many women were wearing in Paris. Provence inspired her use of bright yellow and orange. She mixes her own water based paints and she has some idea how the paints will interact when they are poured on the canvas side by side. The word fondue is the feminine of the French verb fondre ('to melt'). The colors seem to melt an flow together on the canvas. The paintings are abstract yet they feel like violent storm clouds on a distant planet or the delicate vibrant colors of a butterfly wing. The black dripping motif is used often and it reminded me of a piano keyboard as I tried to sketch it. Ironically, earlier that day, I had been writing about color for a Book on Urban Sketching. Christie's bold use of fluid primary colors offered amazing insights about how colors interact. She worked to modern pop French music. Many of the pieces have bold urban graphic elements that look like graffiti stencils. For instance one canvas has a bold image of the Eiffel Tower that then melts into vibrant dripping colors. Subtle blue lettering in French says, "This is not the Eiffel tower." A bright splotch of moon then drips as well. Once Christie starts one of these liquid abstracts, she has to finish it while the paint remains wet. Amazingly she finished her canvas in the same amount of time it took me to do the sketch. La Femme Fondue is being shown at the Timucua White House, (2000 South Summerlin Avenue, Orlando FL), on March 22nd starting at 7:30PM. This reception is one night only. The artwork and prints will be for sale.The White House is a fantastic venue to see Christie's work since the spotlight literally make her canvases glow.